Length: 100'L. Colors: red, blue, green, yellow, black, white, clear. Medium peg hook 3/16" thick. With 30 degree tip. Sold in full cases of 100 pcs/case. 2" long clear plastic tag fits inside shelf channel of Lozier or Madix brands. Put over paper price tag or use adhesive price label on the face of plastic. 2.25" long clear plastic tag fits inside shelf channel of Lozier or Madix brands. Put over paper price tag or use adhesive price label on the face of plastic. 2.5" long clear plastic tag fits inside shelf channel of Lozier or Madix brands. Put over paper price tag or use adhesive price label on the face of plastic. 2.75" long clear plastic tag fits inside shelf channel of Lozier or Madix brands. Put over paper price tag or use adhesive price label on the face of plastic. 3" long clear plastic tag fits inside shelf channel of Lozier or Madix brands. Put over paper price tag or use adhesive price label on the face of plastic. 3.25" long clear plastic tag fits inside shelf channel of Lozier or Madix brands. Put over paper price tag or use adhesive price label on the face of plastic. 3.5" long clear plastic tag fits inside shelf channel of Lozier or Madix brands. Put over paper price tag or use adhesive price label on the face of plastic. 2" long plastic tag fits inside shelf channel of Lozier or Madix brands. Put over paper price tag or use adhesive price label on the face of plastic.Colors: transparent red, transparent blue, transparent green, transparent yellow. 2.25" long plastic tag fits inside shelf channel of Lozier or Madix brands. 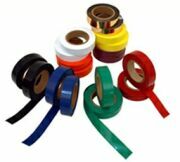 Put over paper price tag or use adhesive price label on the face of plastic.Colors: transparent red, transparent blue, transparent green, transparent yellow. 2.5" long plastic tag fits inside shelf channel of Lozier or Madix brands. Put over paper price tag or use adhesive price label on the face of plastic.Colors: transparent red, transparent blue, transparent green, transparent yellow. Scanner pegboard hook. Sold in full cases of 100 pcs/case. Shelf sign holder with magnetic base. Top loading insert slot, freestanding. Size: 5 ½High X 7"Wide. Color: acrylic/chrome. Shelf sign holder with magnetic base. Top loading insert slot, freestanding. Size: 7High X 11"Wide. Color: acrylic/chrome. Adhesive plastic hang tabs to use with pegboard hooks, slatwall hooks, gridwall hooks or on spinner hooks. Holds up to 14 oz. packaging. 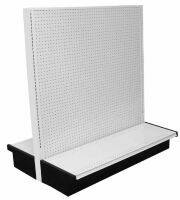 Pegboard mount 14" dia x 6.5"H bowl with arm-holder is used for loose merchandise. Made of plastic. Color: clear. 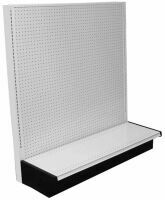 Pegboard mount 14" dia x 6.5"H bowl with arm-holder is used for loose merchandise, includes sign holder. Made of plastic. Color: clear. Double sided liquor shelving section with no upper shelves (additional used upper shelves $8.00 each). All used gondola sections are 48" wide. Heights range in size of 48", 54", 60", 72" and 84". Upper shelves are adjustable. Double sided liquor shelving section with 6 upper shelves (additional used upper shelves $8.00 each). Wall liquor shelving section with no upper shelves (additional used upper shelves $8.00 each). Wall liquor shelving section with 3 upper shelves (additional used upper shelves $8.00 each). 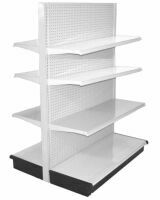 Used upper gondola shelves are adjustable in height and customizeable in depth. Depth range in size from 15", 17", 19", 22". Each shelf easily accommodates 350 pounds. Arrange the shelves to be all the same depth, or situate them to taper off, allowing more light and visibility to lower shelves. End cap liquor shelving section without upper shelves (additional used upper shelves $8.00 each). 15"L pegboard faceout with 6 balls stops for hangers. 15"L pegboard faceout with 5 hooks.